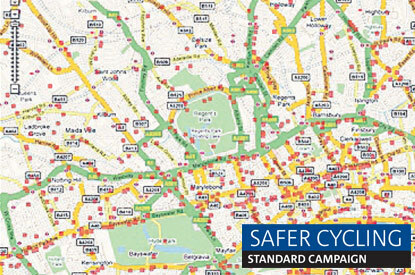 A map via This is London (thanks Berkeley TSC) that pinpoints bicycle crashes in 2007. While an interesting first step, it doesn’t link up to details on exposure details, nor street characteristics, nor time of day, nor exact crash causality — not to mention the danger itself that people view a couple of red dots on their street and think they see a pattern when regression to the mean may see no incidents on that street for the next few years. But this hints at the evolving potential of GIS, etc. Comments Off on The Geography of Danger. Click here to leave a comment. I have a pet theory that roughly 20% of the increase in vehicle miles traveled in the U.S. over the past few decades can be traced to organized youth soccer. My 10-year-old son wanted the chance to walk from our house to soccer practice behind an elementary school about 1/3 mile from our house. He had walked in our neighborhood a number of times with the family and we have driven the route to practice who knows how many times. It was broad daylight – 5:00 pm. I had to be at the field myself 15 minutes after practice started, so I gave him my cell phone and told him I would be there to check that he made it and sent him off. He got 3 blocks and a police car intercepted him. The police came to my house — after I had left — and spoke with my younger children (who were home with Grandma). They then found me at the soccer field and proceeded to tell me how I could be charged with child endangerment. They said they had gotten “hundreds” of calls to 911 about him walking. Now, I know bad things can happen and I wasn’t flippant about letting him go and not checking up, but come on. I live in a small town in Mississippi. To be perfectly honest, I’m much more concerned about letting him attend a birthday party sleepover next Friday, but I’m guessing the police wouldn’t be at my house if I chose to let him go (which I probably won’t). As someone who walked to school every day, rode a bike unhelmeted all over the ‘burbs, etc., this makes me feel like an grouchy old-timer. Comments Off on Safe Routes to Soccer. Click here to leave a comment. Cambridge classicist Mary Beard goes back to school, for speeding, as part of an “educate not prosecute” campaign. The evidence on these programs’ value is shaky, but Beard seemed somewhat positive about the experience (whether that translates into behavioral change is always an open question). What is more I did learn quite a lot. For a start I had no idea that only 4% of traffic accidents in the UK took place on motorways (and accounted for only 6% of the road deaths). Nor did I realise quite how much the level of road casualties had fallen over the last 70 or so years — it is now a third of the 7500 that it was (so estimates have it) in the 1930s. In fact one of the heroes of the morning was Leslie Hore-Belisha, not only the inventor of the Belisha Beacon in 1935, but of the Highway Code too, the driving test and various road markings, that are now taken for granted. Most striking of all was the stuff about the “hard shoulder”. I knew that it is the most dangerous place to be on the motorway. I hadnt realised that average time between stopping on the hard shoulder and being involved in an “incident” was 26 minutes. Can that really be true? Comments Off on A Don’s Education. Click here to leave a comment.